Q: Been a while since you posted anything. How are you doing? A: I have been doing alright, thank you. Now that you mention it, it has been quite a while since I posted anything, 212 days to be exact. Today’s soundtrack provided by Oingo Boingo. The last time I posted anything was right around the time I was working at the music theater. I stopped doing work there when the fall semester started, but I learned quite a bit about metalwork and carpentry while I was there. It was definitely a positive experience. Now onto the present. To be completely honest, the past four months have been hell. I will give you the incredibly abridged version as you probably don’t want to hear all the details. I started out doing okay in the semester but things quickly went downhill. I was having a hard time focusing on my work and slowly stopped going to classes, one-by-one. Throughout this my girlfriend and I were growing further and further apart. Something was missing and we were not meeting each other’s needs. We tried some different things but it wasn’t working. I ended up failing all of my classes and things eventually culminated in our separation. It is still painful for me to think about it, and I loved her very much, but I have no choice but to move on. The future holds better things and I already see a light in the black. Since the break up, I’ve been able to explore another side of myself in alternative lifestyle. It’s something that I’ve been interested in for a long time and I am glad to be able to now. For the record I am being responsible in my explorations and I would appreciate it if any family who read this keep to themselves or contact me privately. Now, do you remember that light in the dark I was talking about? Well I’ve met someone wonderful who I’ve been seeing for the past month. We get along quite well and we just naturally meld. I will post a picture of us from new years. Transition-wise there isn’t a whole lot to say. I’ve been living life as myself for over two years now and though there has been some rough water I am genuinely glad I transitioned. At the moment I am switching my anti-depressant to Zoloft in the hopes that it will help more than the Effexor and lower my anxiety levels. I am slowly realizing that my social anxiety is the root of a lot of inner turmoil. It will be at least a couple weeks until I know if that does anything for me. That just about sums it up, I am taking two classes this semester, trying to keep my course load light. I want to try to get back into some creative hobbies such as music or chainmail as an outlet. Lets let this year be better than the last! I just arrived in New Hampshire with my parents and girlfriend. We are staying in a condo for the weekend. I am going to try to make a post or two talking about the next couple of days. In the mean time here is a quick ask Abbey question I got today. A: Hi Gina, thank you for your compliments. 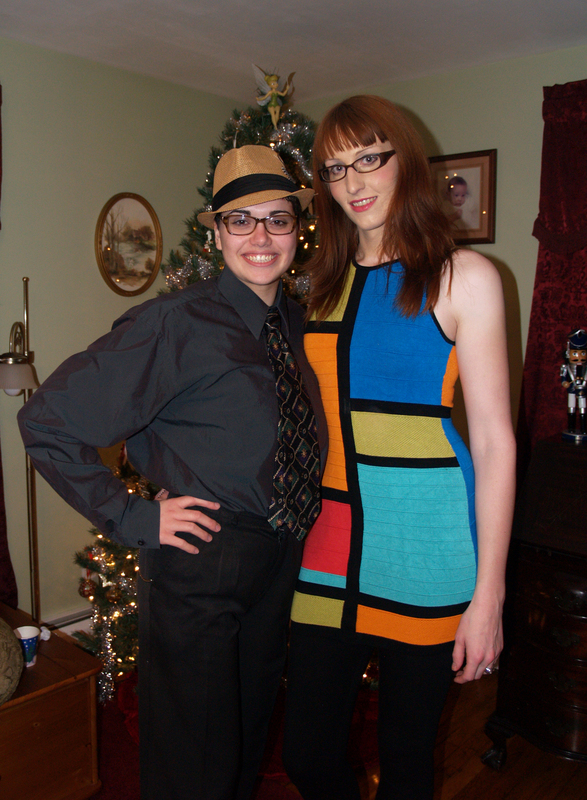 To answer your question, I started taking hormones 4 months after my 21st birthday. It was definitely a good time to start. I am also part Polish! My girlfriend and I have been busy doing some major cooking lately. 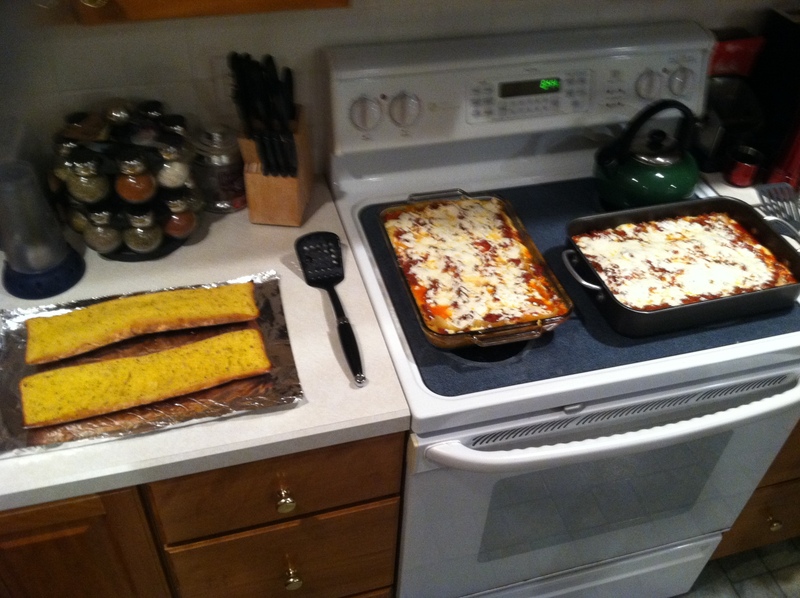 On Thursday we cooked for 4 hours and made 2 lasagnas and some italian bread. For the second lasagna we used gluten-free noodles because my brother has celiacs disease, meaning his body has an intolerance to wheat gluten. It was extremely delicious and totally worth it. Each lasagna had a whopping 4000 calories and there are still leftovers! The recipe we used came from allrecipes.com, this website has a ton of great recipes if you want to try something new! Just last week we made a filling beef stew. I’ve also started washing my hair with baking soda and vinegar. Why you ask? Because the shampoo we use is full of chemicals that strip all of the oils out of our hair and cause the scalp to produce even more oils to compensate for the loss. So the more often you shampoo, the more often you will have to! Shampoo is basically detergent, and a strong one at that. Baking soda is a much milder Alkaline that will still clean the dirt and grime from your hair. Baking soda is a common ingredient in toothpastes for this reason. Because vinegar is an acid, it will neutralize the baking soda. (An acid canceling out a base, brings you back to high school chemistry doesn’t it?) This acts much like a conditioner would. Some of the obvious benefits of not using shampoo is that your head will produce less oil and will be needed to be cleaned less often. No more over-dried frizzy hair! You will also save a lot of money on hair care products, I have become addicted to shampoo that costs $13 a bottle and I will save hundreds of dollars if I no longer need it. How do I wash my hair with baking soda and vinegar? It is very simple, first you need to make a solution of 1 tablespoon baking soda, to 1 cup of water. I put mine in a sports water bottle that fit about 3 cups so that I could easily squirt it over my hair. Next, do the same thing in another bottle with the vinegar, 1tbsp/cup of water. Apple cider vinegar is suggested but I only had white vinegar on hand, both will work just fine. In the shower, squirt the baking soda solution over your hair and massage in for a few minutes, then rinse thoroughly. Then, spray the vinegar solution over your hair and do the same, you may need more or less depending on your hair type. I always comb it through when I take a shower to get out all the tangles. After a good rinse you are done! It has been nearly a week since I used shampoo and I used this combination for the first time last night and my hair came out surprisingly clean. There is a transitional period where your body gets used to the lack of shampoo, oil production should decrease once it realizes it does not need to overcompensate for the oils the shampoo removed. This can take a few weeks to a few months, it all depends on your hair type. I’m going to finish things off with a recent AA question, I will get another post up in a few days after my next electrolysis appointment. Q: I was wondering how easy it is to start hormone therapy in Mass? I’m around the same area you are, and I want to start hormones a.s.a.p. I might be able to start them in like October, but they told me I have to get all these tests done first, which I hope to do in a few weeks. And I was wondering if there were any trans stores around eastern Mass, I know nobody in real life who shares these feelings. It can depend a lot on who you are going to see in order to get your hormones. For me it took about 4-5 months from the time I started therapy until the time I took my first hormone pills. The general rule of thumb is 3 months of therapy before they will give you a letter for hormones, but some will do it only after a few visits. I got my letter at around the 3-4 month mark but it took a while longer due to the time between my lab work appointment and my follow up. (This is heavily dependent on how busy your doctor is) The actual test itself is pretty basic blood work, it should take no more than a week or two to get the results back. From what I have heard clinics tend to prescribe HrT faster than a private therapist would but it is important to make sure they are professional. There is one trans-friendly shop that I know of in Wakefield, MA. It is called Florence’s Fashions and is a small boutique store that has a variety of women’s clothing, wigs, and breast forms. The owner is heavily involved in the trans community and is happy to give you advice help with your outfits. Shopping at a big department store can be extremely intimidating for the first time, Florence’s provides a safe place to start learning what to look for when shopping for women’s clothing. They do not have much casual wear like T-shirts and shorts but they have a decent selection of dressier clothes. Here is a link for more information about Florence’s Fashions.